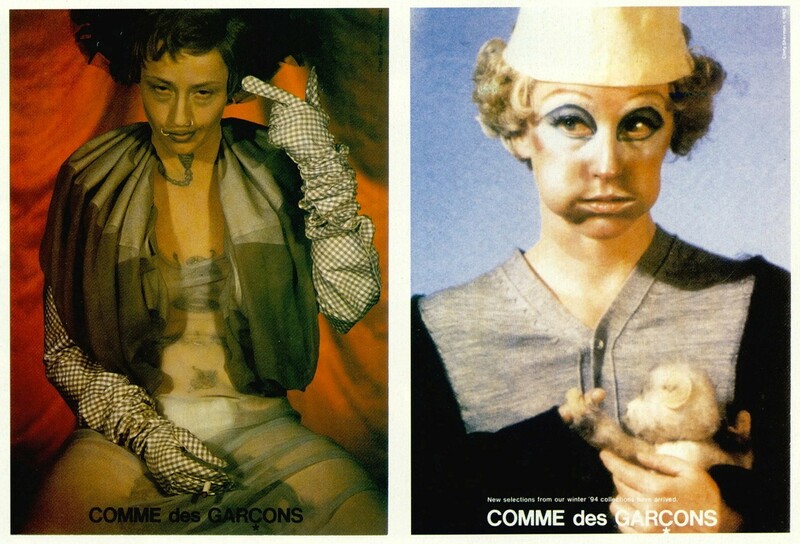 Kawakubo’s international label Comme des Garçons, formed in Tokyo in 1973, is notably famous for setting the monochromatic style and changing the face of fashion in the early 80s. With “as never seen before” silhouettes – shapeless shapes for her simplistic tent-like shrouds poised in black austerity, her clothes are never about accentuating or revealing the body, but allowing the wearer to be who they are. Kawakubo has always de-prettified the models who have stomped down the catwalk in a sombre wake, wearing clothes which initially had to be explained to customers on how they should be worn. The notorious black T-shirt, for example, which appeared to have four sleeves when placed flat, yet turned into a chic double tunic when worn. Comme des Garçons’ hand-knit sweaters full of holes came close to punk, and appeared anarchistic at the time of 80s retentive power-dressing. She sees fashion as art, and designs sculpturally, considering the fabric first. Her minimalist, asymmetric clothes are the epitome of deconstructionalism (seams raw-edged, incompatible fabrics bonded together), inspiring a host of European designers, most notably John Galliano, Martin Margiela, Helmut Lang and Ann Demeulemeester. Comme des Garçons’ kaleidoscopically-themed women's collection for Spring/Summer 96 maintains Rei Kawakubo’s position at the forefront of sensationalism. Linda Evangelista, Kate Moss and Nadja Auermann wore Ronald McDonald crazy-colour, candy-floss wigs and neon knitwear on the catwalk. Kawakubo has always run the business side of Comme des Garçons and outsells either of her Japanese peers Issey Miyake and Yohji Yamamoto by two to one. She has won several awards, held many exhibitions and had various books written about her. Her futuristic vision; her designs for “a way of life” through clothes, furniture, architecture, interiors and perfume and the former Comme des Garçons magazine Six, (which always overlooked her clothes, in favour of features, such as a ten page piece on Gilbert and George), have all established her as one of the 20th century’s most important, innovative and influential designers. Paul Smith: Thanks for letting me interview you. I thought, if it is OK with you, I’d just ask questions that I wish people would ask me, not typical interview questions. Who is your favourite artist and why? Rei Kawakubo: No one in particular. I am usually more attracted to the way they lived their lives rather than their actual works. Paul Smith: I recently went to see Christo’s wrapping in Berlin. Have you seen any of his work? Do you like his work? If so, why do you like it? Rei Kawakubo: I find his concept interesting. Recently I saw a documentary on Christo working on his latest piece in Berlin on BBC which, amazingly, we are now able to see in Japan. Paul Smith: Have you wrapped anything yourself? Rei Kawakubo: Yes. I have wrapped everything conceivable on a body while making clothes. Paul Smith: Do you get time to travel for pleasure and, if so, where do you enjoy the most? If you go on holiday do you prefer to relax, sunbathe, sail, walk or explore new places? Rei Kawakubo: I like to travel to places that stimulate me but I never have enough time. Paul Smith: Is there anywhere in particular you'd love to go but just haven't had the time or opportunity? Paul Smith: Do you fancy Disneyland? Rei Kawakubo: It is the last place on earth I want to visit. Paul Smith: How important is music in your life? What type of music do you like? Do you listen to music while you work? Do you go to watch live bands? Do you go to concerts? Do you own a Walkman? Rei Kawakubo: I never listen to music while working nor do I go to concerts. I like the sound of silence. Paul Smith: I think I'm right in saying that, like me, you're a great fan of Le Corbusier. Are there any living architects whose work you admire? If so, why? Rei Kawakubo: I like the simplicity and spaciousness of Le Corbusier. Paul Smith: Do you find time to go to the cinema or watch videos/television? If so, what subjects do you prefer? Rei Kawakubo: I enjoy films which have strong visuals. I certainly do not watch horror, SF or comedy. Paul Smith: Have you ever been involved in the making of a movie in any way? Paul Smith: Do you have any plans to get involved in film in the future, or would you like to? Paul Smith: What are your three favourite movies? What makes them special for you? Rei Kawakubo: Films by Theo Angelopoulos. Paul Smith: Do you find time to read? Do you read Japanese or Western writers? Who is your favourite author? Did you read comics as a child? Rei Kawakubo: I have a tendency to buy books I want to read and they end up piling up on my desk, since I have little time to read. Paul Smith: Do you have any sisters or brothers? Rei Kawakubo: Two younger brothers. Paul Smith: Are they involved in Comme des Garçons or in fashion at all? What are their professions? Did they have an influence on your career? Rei Kawakubo: No, they are not involved in fashion. No, they do not influence my work. Paul Smith: What is your earliest childhood memory? Mine was at the age of 11, incident of given bicycle. Rei Kawakubo: The seasons. Glaring sun and its heat. Snow piled up as high as one metre. Paul Smith: Many people in Japan ride bicycles; do you? Rei Kawakubo: I prefer walking, but I have been able to ride a bicycle since I was a child. Paul Smith: Over the years you have worked with many of the world’s famous photographers. Do you take photographs? If so, do you prefer to use black and white, or colour films? Is it to record your and your friends’ lives, or is it an art form? Rei Kawakubo: I enjoy looking at photographs but loathe being photographed. I’d rather make clothes than take photographs. Paul Smith: Other than Japanese, what food do you enjoy? Rei Kawakubo: Spicy food, especially Thai. Paul Smith: Do you cook at home? Paul Smith: Have you ever eaten real English food? What do you think of it? Rei Kawakubo: Yes, I have eaten full English breakfast, which I like very much. Paul Smith: Do you enjoy married life? Rei Kawakubo: I enjoy my life. Paul Smith: Do you have any children? Rei Kawakubo: Yes, 425. They all work at Comme des Garçons. Paul Smith: Are you an animal lover? What is your favourite animal? Do you have any pets? If so, what and how many? Rei Kawakubo: I like all animals, especially wolves. Paul Smith: What do you fear the most? Rei Kawakubo: The next collection. Paul Smith: What do you feel you’d still like to achieve in life? Paul Smith: What car do you drive? Rei Kawakubo: A big old Japanese car. Paul Smith: What is your favourite month and why? Rei Kawakubo: The ones that do not have collections. Paul Smith: What is your favourite number and why? Rei Kawakubo: Odd numbers, because they are asymmetric and strong. Paul Smith: What is your lucky charm? Mine is a rabbit. Rei Kawakubo: I don't have one. I never even thought about it.